When I met James and his family, they were thinking of changing their ornamental garden to an edible one. At first glance, this Noe Valley backyard might not seem like a good place for a vegetable garden – it’s small, mostly paved, with northeast exposure. However, from March to November, the sun is high enough in the south to light up much of the yard. The site is also protected from harsh coastal winds. I removed plants, landscape fabric and mulch, amended the soil, and successfully transplanted a small tree from the backyard into the sidewalk. James had a great idea early on: add containers on wheeled platforms to increase productive space but keep use of the space flexible. Because some parts of the yard are only sunny part of the year, we can move the containers to take advantage of the available light, or move them out of the way for backyard barbecues. Irrigation connections to the containers have on-off switches so containers can be added or subtracted as needed. 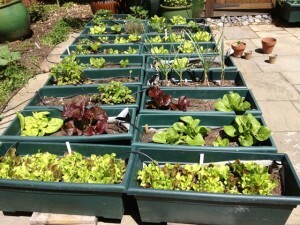 This cool microclimate is best for greens such as kale and collards, and a variety of gourmet lettuces. Berry plants such as huckleberry and alpine strawberry are also very successful. A Meyer Lemon tree and other perennials grow in a containers and the garden beds are mostly annual crops. Tomatoes and basil can be grown in the summer. The front of the house gets much more sun and heat but growing space is limited. Herbs, ornamentals and cherry tomatoes grow in front.